A few weeks ago, I personally visited some of the communities in Samaria, to get an update on their needs and to gain a first-hand perspective on how your support has helped them. It was a wonderful opportunity to drive through the mountains I love and visit with the leaders and ordinary residents that represent the heartbeat of this land. I began the day with Hananel Durani, mayor of Kedumim. There is a special place reserved in my heart for Kedumim since I was privileged to spend a cold weekend in a tent in that community when it first started 43 years ago. Today, Hananel is also the chairman of the Yesha Council and he updated me not only on the challenges facing Kedumim but on issues of concern for all the communities in Judea and Samaria. Those concerns can be summed up in one word: security. Just before our meeting, there had been a series of terrorist attacks, all in the Benjamin region of Samaria, all with fatal consequences. There was the tragic drive-by shooting of Amichai and his pregnant wife Shira Ish-Ran near Ofra. We all cried when they lost their baby. Miraculously, Shira was recently released from the hospital and is now in rehabilitation. 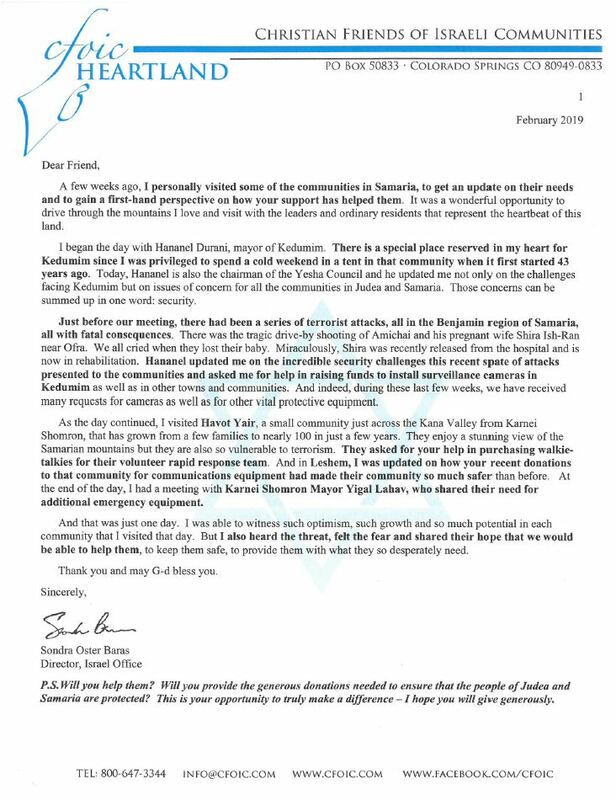 Hananel updated me on the incredible security challenges this recent spate of attacks presented to the communities and asked me for help in raising funds to install surveillance cameras in Kedumim as well as in other towns and communities. And indeed, during these last few weeks, we have received many requests for cameras as well as for other vital protective equipment. As the day continued, I visited Havot Yair, a small community just across the Kana Valley from Karnei Shomron, that has grown from a few families to nearly 100 in just a few years. They enjoy a stunning view of the Samarian mountains but they are also so vulnerable to terrorism. They asked for your help in purchasing walkie-talkies for their volunteer rapid response team. And in Leshem, I was updated on how your recent donations to that community for communications equipment had made their community so much safer than before. At the end of the day, I had a meeting with Karnei Shomron Mayor Yigal Lahav, who shared their need for additional emergency equipment. And that was just one day. I was able to witness such optimism, such growth and so much potential in each community that I visited that day. But I also heard the threat, felt the fear and shared their hope that we would be able to help them, to keep them safe, to provide them with what they so desperately need. Thank you and may G-d bless you. P.S. Will you help them? Will you provide the generous donations needed to ensure that the people of Judea and Samaria are protected? This is your opportunity to truly make a difference – I hope you will give generously.